Clockwork’s Inverness branch is our most northerly branch in the UK, located on the busy Longman Industrial Estate just before the Kessock Bridge. 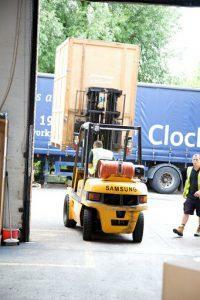 The branch offers residential, commercial and international removals as well as domestic and trade storage. Where do you most commonly ship to for international moves: USA, Canada, Australia, and New Zealand. What has been your most interesting move: There are a lot of historic buildings and castles in The Highlands and we have worked in a number of these, both for commercial and private moves. We offer specialised high-value removals where we build bespoke crates for antique mirrors and chandeliers etc. These are probably our most unusual type of moves. What is the most interesting item you have ever had in Storage: We have stored a huge MRI Scanner for a private healthcare company and we also store oversized machinery used in the renewables sector. For more information on our removals and storage services in Inverness, contact us today.